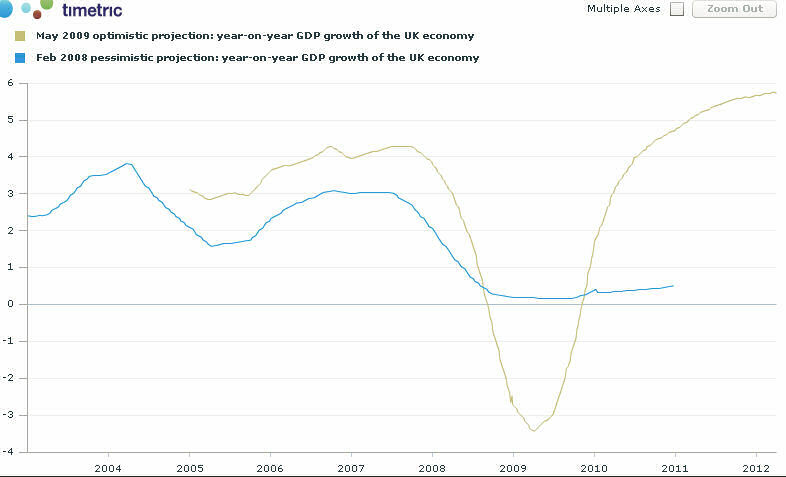 Britain's recession officially started in the middle of 2008, but revised data now contradicts the Chancellor of the Exchequer, Alistair Darling's statement at the time and it seems the recession had already begun earlier in the year. Not only that but some graphists Note 1www.Timetric.com show that the forecasts produced by the Bank of England are not only much worse than they had predicted but worse than they ever conceived was possible. Recent figures released by the Bank of England show growth returning in the last quarter of 2009, bringing the official period of recession to an end. Against this backdrop of economic decline, how has the sector for fine wine fared in the UK? Statistics generally follow the market with some considerable time lag. However, some current background can be demonstrated from the release of recent figures for exports of Champagne (to March, 2009), the Liv-Ex Index, imports correlated by H M Customs and auction data for fine wine sales. All markets for Champagne were down by a total of 27% for the period January-March, 2009 in respect of the previous year. UK imports (bearing in mind the UK is also the largest importer of Champagne, by far) were down 40% for the same period. US imports were down a massive 50%, leaving Germany bringing up the position as the second largest importer, but with only one third of the value of exports to the UK. Figures from H M Customs for the period Jan-May, 2009 show that wine imports into the UK from France have decreased in value terms by 18%, whereas quantities imported have fallen by 32% when compared to the same period in 2008. Note 3Trade Data H M Customs for Goods. 2204: Wine of fresh grapes, including fortified wines, grape must, partly fermented, of actual alcoholic strength of >0.5% vol, whether or not with added alcohol. Our own Fine Wine Index Note 4FWAI50 - based on 50 wines from Bordeaux divided into different vintages. Visit www.finewinejournal.com for more information. Fine Wine's database of auction data is made up of more than 120,000 individual records of auction lots sold since 2004. has shown some increase in the last fews months (the April FWAI50 stands at 183.58) hitting a level which it had not seen since October 2008, but nonetheless well down on the Index for June, 2008 when it reached a peak of 279.11, a decline of some 34%. The April figure might be seen as the last jump of a dead cat, or demonstrating some recovery of the market. The reality is probably somewhere in the middle. Auction houses have worked hard to bring in buyers through attractive estimating – auction bidding (and thus prices) is largely a function of the number of people in a room, whether they are physically present, offer absentee bids, or bid online or over the telephone. Another reason for this increase in auction prices is the influence of buyers from the Far East who have been attracted to auctions in Hong Kong, along with their translated catalogues and high profile sales offering some stunning collections. Lafite Rothschild 1982, 1985, and 1989 have shown some remarkable resilience and indeed growth. Others, such as Margaux 1982, have been very disappointing. Auctions probably offer the best means for any fund or individual to estimate the worth of their portfolios. They are the ultimate test of a wine's value both in terms of perceived long term investment and when the wine has reached maturity. The values are transparent, openly published and offer a significant sample of data which other systems lack. Stories from around the industry can fill in the cracks of the hard data..
John Armit is the agent for Sassicaia in the UK. 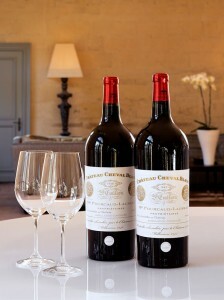 They recently released the 2006 vintage at GBP450 (x6)and sold out in 2 days. Their allocation was down slightly from the year before. They obtained a further tranche from the domain which they have released at GBP600 per case and have been selling it happily since. Ornellaia 2006 was a similar story, an excellent vintage, which sold very quickly. Armit views the wines as a mid-level investment for enthusiasts with consistent returns, but they are aware that the sale was helped by the success of the vintage and the good reviews they received in the press. Andrea Ruggeri, is Commercial Group Director at Matthew Clark whose turnover is approximately GBP550million per annum giving them about a quarter of the UK's on-trade market. Fine wine is perhaps around 4-5% of their business. He's clear: “it's a nightmare. Another friend of mine who ran a Michelin starred restaurant has just gone into receivership”. Ruggeri has been buying wine for 36 years and he says he has “never seen it so bad”. Looking into their figures he estimates the losses in fine and premium brands to be anything up to 28% across the board without one example showing positive gains. Despite this, Matthew Clark's distribution points are up, they are increasing market share, selling more volume and turnover is up. The mid-range GBP30-GBP50 is where all the damage is being done irrespective of country or style. Margins are being hit and as clients trade down, driven to find customers, the overall cash margin declines too. 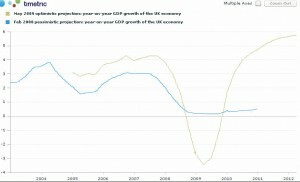 Ruggeri thinks that there will be no recovery before mid-2010. At Marc Fine Wines, Patrick Headlam acknowledges that these are testing times - “a notable down spend” is how he describes it for his restaurant group and more significantly for the top end Michelin starred restaurants they supply. People are looking for better value and the industry suffers from a two-fold problem. These are not just difficult trading conditions, where “not only are top end wines are struggling to sell to some degree but everything we're buying from the Eurozone is 25-30% more expensive”. Headlam has found people are looking for better value wines in the mid-priced list in the classic areas, so lesser Bordeaux vintages, for example, are becoming prospects, along with second wines such as the Réserve de la Comtesse (the second wine of Château Pichon Longueville, Comtesse de Lalande). Headlam has also noticed a big switch to wines out of the Eurozone, with clients wanting better value wines from Chile, South Africa and Australia. Headlam admits that they have split margins “depending on the wine and the client”. Champagne, as already indicated, is where they're seen the biggest decline with clients trading down to other sparkling wines. He has recently had to introduce a new house Champagne at a cheaper price point for the Marc group of restaurants. Sales of Prosecco have seen a significant increase. J Sainsbury plc saw like-for-like sales rise in the first quarter of 2009 by 7.8% Note 5Like-for-like sales up 7.8 per cent excluding fuel and VAT, J Sainsbury plc First Quarter Trading Statement for 12 weeks to 13 June 2009, issued June 17, 2009. Their fine wine section is up 15% during the period from January to May as compared to last year. Fine wine at Sainsbury’s begins at slightly over GBP10 and goes up to GBP50 for still wine. Hence customers have been able to enter or remain in the fine wine category at relatively modest price points compared to some definitions of fine wine. Customers seem to be driven by country rather than variety in their choice. French wines account for approximately half their range and sales. Here the place of origin, whether region e.g. Burgundy or appellation, such as Chablis, is probably more important than the varietal. For new world lines varietals seem to be more important, but even then customers seem to have a favourite country from which they expect it to originate e.g. New Zealand, Sauvignon Blanc and Pinot Noir; Australian Chardonnay or Shiraz. Champagne sales are slightly down year on year, whereas Sparkling wines have performed slightly ahead. The success of categories such a Cava and Prosecco suggests that Champagne and sparkling wine customers are prepared to shop around the wider sparkling category. The decline of the Pound versus major currencies such as the Euro and US$ may have brought in new customers to the fine wine market in the UK at the end of 2008, as people bought up stocks from merchants who listed their wines at old prices, effectively an exercise in arbitrage. Even some French négociants came over to London at the end of last year to buy some cases of the 2005 Bordeaux vintage. Across the UK restaurants are offering excitingly priced and imaginative lunch menus which tend to pair with cheaper wines – a correlative consequence of this market. However, the on-trade is experiencing severe difficulties. Blue chip wines are strongest in this market as not only do they offer security but, in a buyer's market, better value than other sectors. Any wines offering value for money will sell albeit in smaller quantities. Auctions have benefited from strong sales, but at lower hammer prices, due to an increased number of buyers in the marketplace and low estimating by auction houses attracting hopeful bidders, whilst the Far East have provided the headlines. The months following the summer will provide the acid test for the economy. Should the UK emerge from the recession ahead of the rest of Europe, which is the current thinking, then the market may pick up if consumer confidence grows along with it. The danger is that if the UK economy misses its targets, the government runs up an unmanageable public debt and the Bank of England has to continue with its policy of quantitative easing, then a currency crisis will be exacerbated. This scenario will compound the problems being felt in the on-trade. However, any stocks of blue chip wines will find buyers from overseas. An edited version of this article appeared in Harpers Wine & Spirits in July, 2009. 3. ↑ Trade Data H M Customs for Goods. 2204: Wine of fresh grapes, including fortified wines, grape must, partly fermented, of actual alcoholic strength of >0.5% vol, whether or not with added alcohol. 4. ↑ FWAI50 - based on 50 wines from Bordeaux divided into different vintages. Visit www.finewinejournal.com for more information. Fine Wine's database of auction data is made up of more than 120,000 individual records of auction lots sold since 2004.